The Tomb of Horrors is one of the most infamous and difficult dungeons Gary Gygax ever designed. It was famous enough for a major plot point in Ready Player One, easily the best part of a novel I otherwise loathed. It recently appeared with a D&D Fifth Edition conversion in Tales from the Yawning Portal earlier this year (Roll20 Review coming soon!). I was a bit surprised, though certainly not disappointed, that Acererak’s infamous dungeon would be the inspiration for Dungeon & Dragon‘s next major story campaign, Tomb of Annihilation. The Roll20 Tomb of Annihilation module is the best work Roll20 has ever done. Tomb of Annihilation is already a very virtual tabletop-friendly campaign, and Roll20 went even further with interactive maps for puzzles and rooms, a token-filled page of random encounters, and all the written and visual content you’ll need to send your players into the dangerous jungles of Chult. Over 50 player handouts and pictures, not including NPC pictures. We’ll start with the Journal, which offers an overwhelming amount of handouts for players and information for game masters. The adventure is divided up into five chapters that cover the entire story. The players arrive in Port Nyanzaru in chapter one. The entire chapter takes place in the major port city of Chult, the only safe haven on the entire peninsula. There’s a nice Things to Do subsection that offers detailed information on dinosaur racing, finding a guide, and learning rumors from locals. Each chapter also has its own list of applicable handouts, such as all the guide posts for chapter one. Chapter two is the meat of the adventure and the open world exploration of Chult. The goal is to find Omu but along the way they could trick a Grung chief at Dungrunglung, heed the advice of a friendly naga at Orolunga, or ride a minecart down to a red dragon lair in Wyrmheart Mine. Not to mention dozens upon dozens of random encounters. Each of the 14 major locations are given their own detailed entry with a DM map. All the artwork from the published adventure are provided as separate player handouts. A Journal entry called The Expedition Begins has extensive rules for traveling and random encounters throughout Chult. 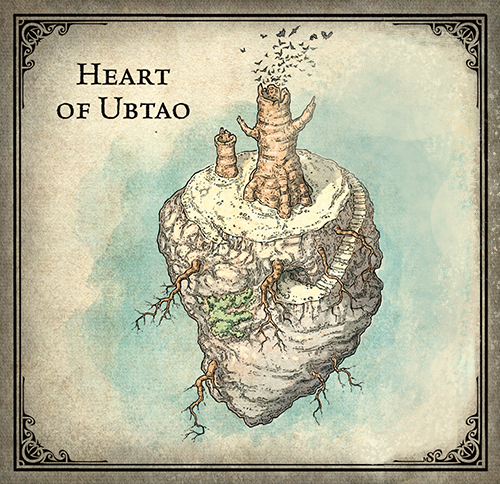 Chapter three begins once the players reach the lost city of Omu, which shouldn’t be until the players are at least fifth level (and probably higher). The action takes place on a non-gridded city map. The measurement tool does provide some accuracy but movement and distance in battle will have to be fudged a bit unless you come up with smaller maps for individual sections. Smaller maps do exist in the form of the nine shrines that are the focus of chapter three. 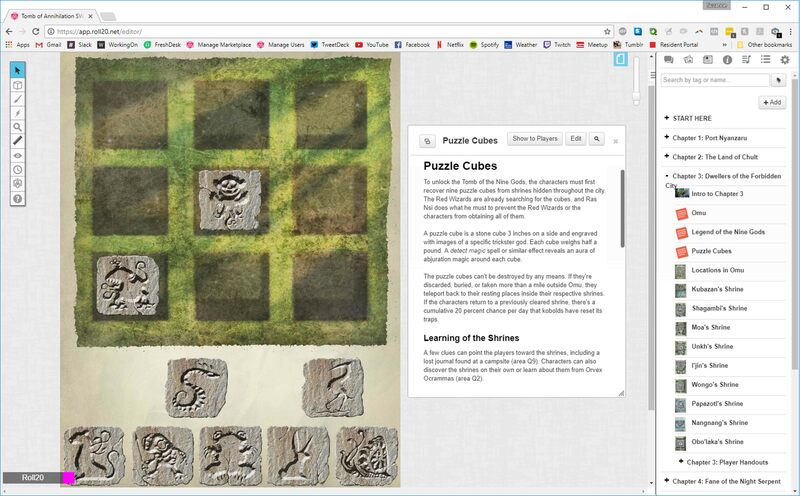 The players’ goal is to collect the gods’ puzzle cubes to open the way to the Tomb of the Nine Gods. The shrines are placed together on a 5-ft battle map as a series of one-room challenge dungeons with nifty puzzles and traps. Adventure game fans will get a real kick out of this section as there are lots of clever puzzles and riddles to solve. Dynamic Lighting separates each shrine from one another. Chapter four occurs once the players have located most of the puzzle cubes. Raz Nsi, the yuan-ti warlord with quite a villainous past, swoops in to grab the last one, forcing the players to delve into the underground yuan-ti lair, Fane of the Night Serpent. With chapter five we finally get to the titular tomb. The Tomb of the Nine Gods rivals Castle Ravenloft in sheer end-dungeon size and breadth, taking up six full 5-grid map pages. The dungeon is filled with enough devious puzzles and traps to make veterans grin and newcomers blanch. I love the way journal entries are divided and organized here to make locating information much easier. They provide notes on treasures, occupants, the nine trickster gods, the tomb’s history, and the hag coven and wights who run it. Yeah, turns out Acererak is more of an absentee landlord who’s using this place to nurse an infantile dark god. This isn’t even his lair! Yet he shows up at the end to provide a climactic final boss fight anyway. Over two dozen player handouts are provided in chapter five alone. Found journal notes, pictures of various scenes and objects, and Acererak’s warnings (puzzle clues) give players a wealth of fun information and visual aids. Dozens of monster sheets, monster handouts, magic items, and additional rules notes take up more than half of the Journal section. Every single monster has a draggable token you can use to instantly add it to any battlefield. There’s also an entire map page dedicated to listing every token, with AC and HP already implemented. Unfortunately not every monster token has a picture; a few (less than 10%) simply stamp the creature’s name on the token if no official artwork exists. 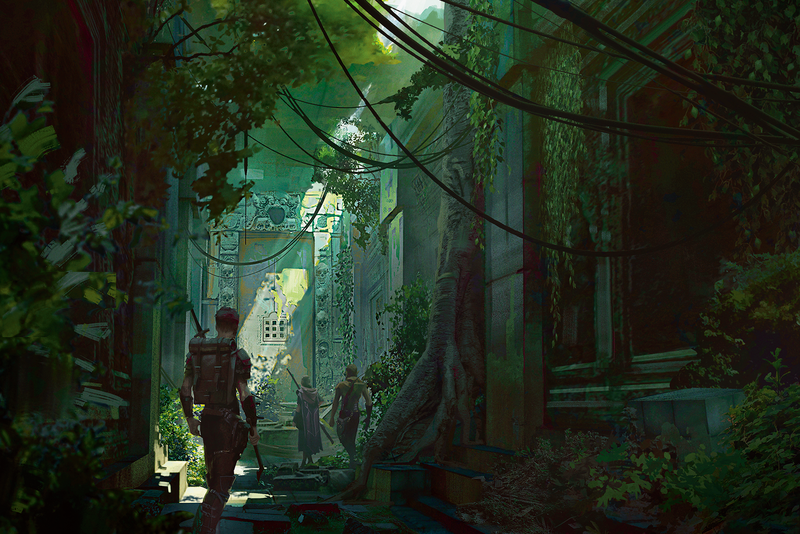 Tomb of Annihilation can rely heavily on random encounters – Chult could almost be considered one big mega-dungeon. The rules state that players move only a single hex per day, rolling for encounters three times. An encounter occurs on a 16 or higher. That’s a 25% chance! To help with the staggering amount of potential encounters, the module provides a second token page keyed to random encounters. Here tokens are organized and grouped by their printed encounters. Included notes provide information on how many of which foes should be present. 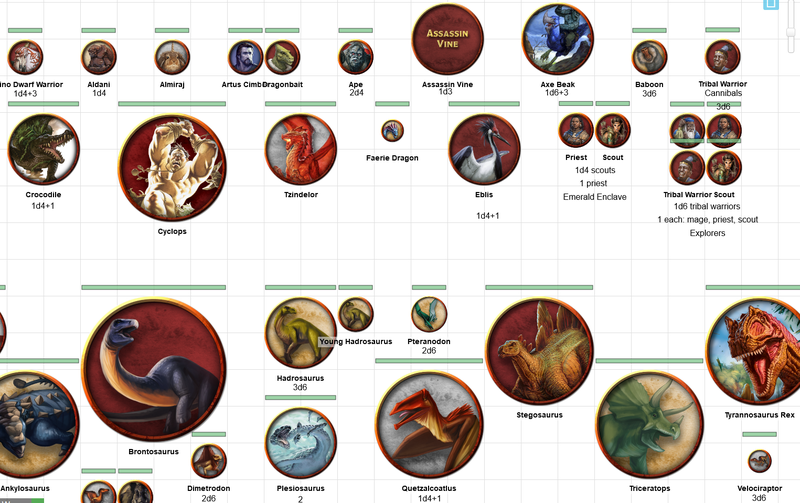 The encounter page organizes tokens alphabetically and by type (Dinosaurs, Undead, etc). It shouldn’t be too hard to find what you’re looking for. As always I recommend DM’s roll for encounters ahead of time so you don’t have to spend much time moving tokens around. A random battle map is also provided. It’s slightly better than the usual blank white grid, offering a more textured page that looks coffee-stained. It’s a shame we couldn’t get a single generic jungle page for the huge amount of random encounters, but it also shouldn’t be too hard find or slap one together. If I ran Tomb of Annihilation I would endeavor to put together half a dozen mini-maps by region for random encounters. The journal and tokens are top-notch, but what about the maps? One of Tomb of Annihilation’s best features is an emphasis on 5-ft square grid maps. 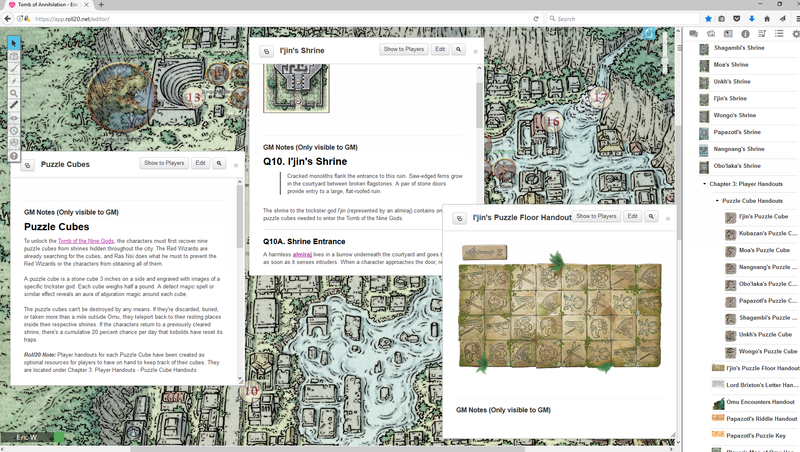 Having anything else can cause issues and visual problems in Roll20 that have to be corrected. Roll20’s licensed modules usually solve this by grids for 10-ft maps, which results in tiny tokens. Thankfully not many adjustments are needed here. Of the 24 battle maps, only three are adjusted from 10-ft grids, and one of those is a mostly friendly fortress that you probably won’t battle within. Instead you can bask in the the Dynamic Lighting, annotated GM Layer, and numerous linked tokens that have been provided on each map. I especially like that extra tokens and reinforcements are provided on each applicable map as written in the adventure. The single pirate ship map, for example, has all the tokens for three separate pirate crews the players can encounter. There’s a lot of fun variety in the adventure. Chultan locations include a hidden pirate cove, ancient ruined cities crawling with crocodiles and sentient plants, an abandoned dwarven mine and forge ruled by a dragon, and a maze with worshiping frog-people at the center. That doesn’t even include the large yuan-ti dungeon and the gigantic six-level Tomb of the Nine Gods. Most locations provide some fun artwork or piece of the area you can show your players without showing them the entire map, like the ancient statues at Camp Righteous and Dungrunglung, or the unique 300-ft spire of Firefinger. 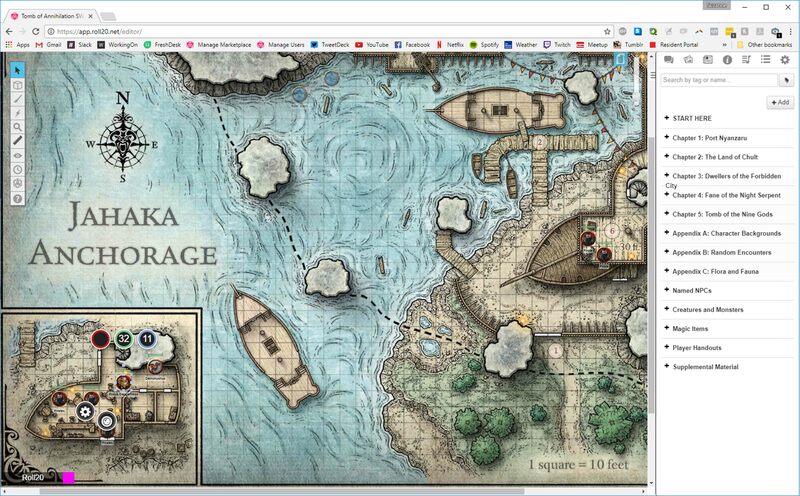 The two most impressive map features in the module are the player map of Chult and the interactive puzzle maps. The overland map of Chult comes in two flavors: a full DM map with all the information, and a special player’s map with many locations on the hidden GM layer. More importantly it has entire swaths of the map hidden below an interactive fog of war, displayed as beige hexes that cover unexplored sections of the map. It’s an incredibly clever solution that’s much easier to navigate and operate than using fog of war. As your players explore the map you simply delete the hexes, opening the map as they discover new regions. The interactive player maps mainly come from two sources – the puzzle cube and the Gears of Hate from the fifth level of the Tomb. The puzzle cubes give your players a chance to grab each cube and configure them on a 3×3 grid in order to gain entrance to the Tomb. The Gears of Hate is an awesome map, made even better with Roll20’s unique implementation. By switching to the map layer you can rotate the three gear rooms the same way you would a multi-sided token. There are five different configurations and a Myst-like control system that your players have to learn with trial and error. I was stunned by how well it worked, and it looks great. There are also two puzzle floor maps you can put your player’s tokens on to let them physically move around to reenact tense moments from Indiana Jones and the Last Crusade. In many ways Tomb of Annihilation represents the culmination of over a year of adapting large-scale campaign modules. It’s not just the size that’s impressive, but the helpful features it provides, both for players and game masters. 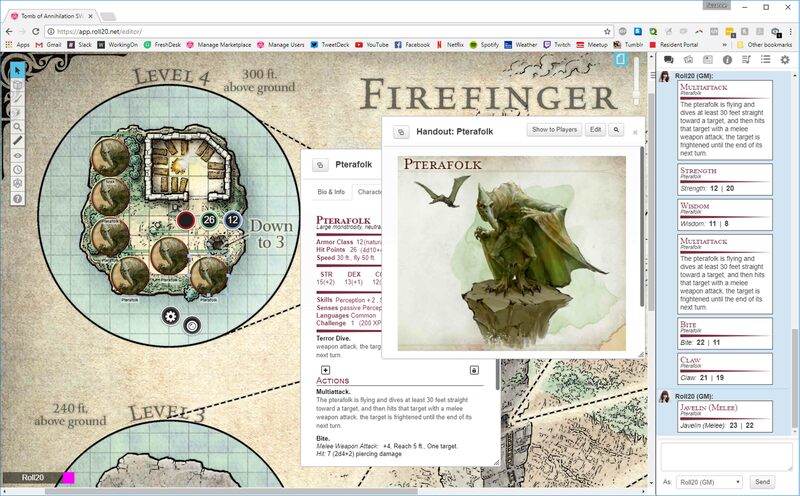 Multi-sided tokens, hidden and annotated maps, token pages, puzzle rooms, and dozens of player handouts make Tomb of Annihilation a clear winner on Roll20, and the best way to enjoy the new D&D campaign online. Actual moving gears on the Gears of Hate map! The Wreck of the Star Goddess map could use some GM layer annotations for height differences of each ship section. The Verdict: Tomb of Annihilation is the most Roll20-friendly D&D 5e adventure to date, and the module provides most of the content, and some nifty extra features, to take your players on a memorable rumble in the jungle.